Karin Teske is a health policy analyst at CHRT. She works on client evaluation, health policy analysis, and assists with project management of various initiatives for local and state healthcare reform. 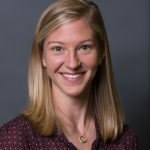 Before joining CHRT, Karin was an ORISE research evaluation fellow at the National Center for Injury Prevention and Control, in Atlanta, Georgia. She has experience as a compliance specialist working within the Human Research Protections Program at the University of Michigan Office of Research, and has interned at Monroe County Health Department and the Michigan Public Health Training Center. Karin holds an MPH and MA from the University of Michigan School of Public Health and School of Education, respectively, and a BA in Biological Sciences from Miami (OH) University.